Forgot to plan dinner tonight? 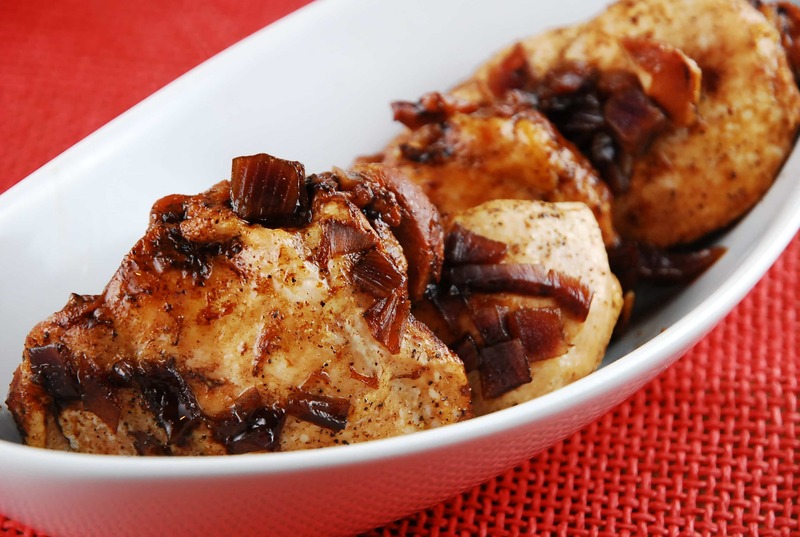 If so, this easy Sweet Balsamic Chicken Recipe is the way to go! It’s a super easy chicken dish with ingredients that you most likely have on hand. It can be prepared quickly and delivers a wonderfully moist, tender chicken that is incredibly flavorful. The sweetness of the vanilla and orange are a wonderful contrast to the rich tang of the balsamic. And when the chicken soaks up the incredible flavors from sauce while cooking, the result is a wonderful Weight Watchers chicken recipe that the whole family will enjoy. In a pinch, I’ve used red onions instead of shallots, honey instead of brown sugar, and fresh squeezed orange juice instead of store bought…all resulted in a great dish. I like to add in some chopped vegetables with the chicken and the sauce before cooking, and then serve over some whole wheat couscous….it’s AMAZING, and a great way to give those veggie servings some serious flavor. Preheat oven to 400 degrees, and spray a large baking dish with nonfat cooking spray. Season chicken generously with salt and pepper, and place in baking dish. In a small sauce pan, combine remaining ingredients. Bring to a boil. Reduce heat to medium, and let simmer until sauce reduces down a bit, about 15 minutes. Pour sauce over chicken and cover baking dish with foil. Poke a few holes in the foil ;to allow for steam to escape. Place in oven and cook until chickens cooked through, about 20 minutes. Remove foil and place back in oven for another 10-12 minutes to brown the top of the chicken. Let cool about 5 minutes before serving. Couple of questions: could I make this in the Crock-Pot and would it be as delicious? I haven’t tried it myself, though I don’t think you would get that nice caramelization of the shallots and the golden outside of the chicken. Also, as the chicken cooks in the crock pot, it releases a lot of water which would fix with the sauce and weaken the overall flavor. I wouldn’t recommend it. Will make this again. We really enjoyed it. Tossed the leftovers in Weight Watcher/The Chew chef contest “California Hash” recipe which I have made a couple of times, and it worked quite nicely.